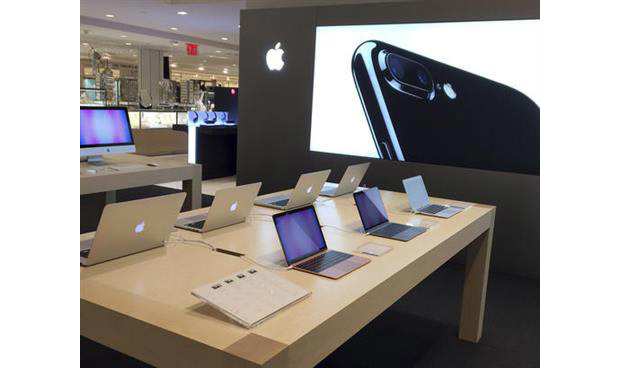 As scheduled, Apple's store-within-a-store at the Macy's Herald Square flagship location in New York opened for business on Friday, granting customers access to a selection of tech giant's most popular products. Initially announced in September, the Macy's hub sells a variety of top Apple products including iPhone, iPad, MacBook and Apple Watch. According to the Associated Press, the dedicated outlet in New York also stocks the new Nike-branded Apple Watch Series 2. Modeled after Apple's iconic retail stores, the nooks feature wooden display tables and large vanity shots of products like iPhone 7. Beyond the Apple section, Macy's is also erecting dedicated tech zones selling Apple Watch and other smartwatch devices. The standalone smartwatch areas are being rolled out nationwide at 180 Macy's locations. In a bid to draw in female customers, Macy's placed the Apple shop on the main floor amidst an assortment of cosmetics and fragrances counters. "This is one of the most sought-after products," Lundgren said. "We really cater to women better than most retail stores do. I do think that we are going to end up creating a business that is more female-friendly." Lundgren went on to say the Apple deal was years in the making. For Macy's, the Apple retail integration is part of a larger initiative to blunt six quarters of declining sales. The turnaround strategy involves creating additional store-within-a-store areas, including an upcoming collaboration with Luxottica that will bring LensCrafters outlets to some 500 Macy's locations over the next five years. The department store is also considering an expansion of its existing deal with Starbucks.